STOCKTON - Jacob Gomes, #16 and Joey Stearns, #8, had different opinions of what transpired late in the NASCAR Western Late Model's Tri Holiday Classic. Gomes believed he was racing clean when Stearns spun out after hitting Gomes' car. Stearns thinks Gomes took out the leader. The officials sided with Gomes, and he won the the race and the Tri-Holiday championship. Gomes took the lead after Stearns spun on lap 124 of the 150-lap event and got his second victory in the three-race series. Stearns led most of the race and held off Gomes, 16, on three previous restarts. The cars came together as they came to the starting line and Stearns slid up against the wall. The officials ruled Gomes was not at fault. "Every lap we hit going down the front stretch, and all of the sudden he came across my nose. I don't know what happened," said Gomes, a Manteca resident. "I gave him three clean restarts, and I guess he didn't like getting beat," the Stockton driver said. "You'd think if you take out the leader, you would be sent to the back." The WLM results were unofficial at press time. Jeff Ahl of Lodi took the lead with 23 laps to go and earned the victory and the Street Stock version of the Tri-Holiday Classic. Sam Solari of Escalon seemed to be in control of the 75-lap event, but Steve Fraser Jr.'s car spilled oil on the track on lap 52, and Solari and Vosburg spun out in turn No. 2. Aaron Coonfield took the lead and Ahl took second. On the restart, Ahl battled Coonfield for two laps until he took the lead. Solari regrouped and charged through the field to finish second. Scott Winters of Tracy won his 12th main event of the season and completed his sweep of the three Tri-Holiday races to claim the title. Tom Dahl of Stockton won his sixth Bombers main event of the season, but Ben Lewis' second-place finish was enough to clinch the Tri-Holiday divisional title. The not-too-distant crackle of autumn is always a welcome sign. The late sun drips through elms like warm butter. Intermittent strokes splash, bright yellow, across the asphalt-tone canvas. Like a dream, the Season’s memories begin to bow their weary heads and fall gently toward eternity. On Saturday, September 5th as this Racing Season nears its end, California Welding Supply Co. 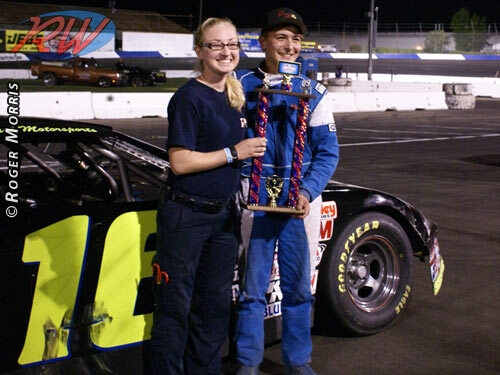 Presented the 2009 Tri-Holiday Classic Series Race #3 with the NASCAR Whelen All-American Western Late Models in 150 Laps, Grand American Modified 50 Laps, ALSC/Street Stocks 75 Laps and the Bombers 60 Laps. Also, a Fabulous Firework Show capped off the evening. The Asphalt Warriors of the Western Late Model Division returned to action after a week off to continue the battle over bragging rights as to who will own the most wins by Season’s end. 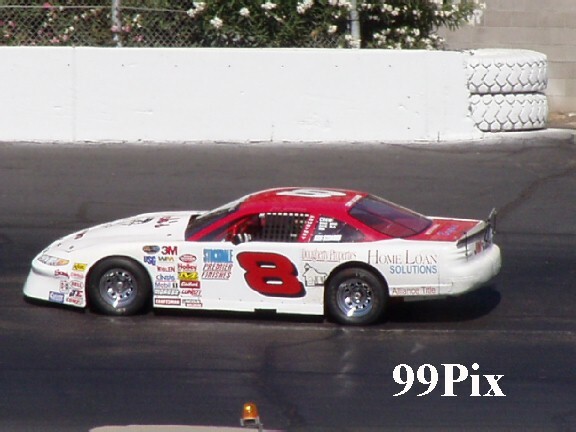 The 2009 Championship pretty much lies in the hands of Points Leader Justin Philpott, but there were no signs of surrender from the rest of the field on this night. Joey Stearns (8) of Stockton started this one from the point with Young Gun Nic Belletto (15) flanking him to the right. The battle for the top spot went back and forth for the first few laps with Belletto coming out on top by lap 3 and holding tough, despite intense pressure from the #27 of Stockton’s Vito Ranuio, until lap 16 when Belletto finally succumbed to the relentless hounding as Ranuio drove by for the lead and remained there until lap 39 when Points Leader Justin Philpott (05) of Tracy slowed on the track with his tail piece flapping in the wind which brought out the first yellow of the night. The lap 42 restart was halted immediately with two separate incidents: Mike Beeler (6) of Salida and Modesto’s Rodney Funston (78) made contact coming out of two with Funston coming to an abrupt stop head-on into the backstretch wall which ended his night. At the same time, the leaders, Ranuio and Michael Wendt (2) of Lodi, made contact coming out of four which sent the red flag flying. Coming back around to lap 43, Stearns once again took to the point only to be overcome on lap 46 by Modesto’s Jeff Belletto (12). Belletto would pace the next 26 laps, but on lap 69 the misfortunes of mechanical problems struck again for the second race in a row which put an end to his night. 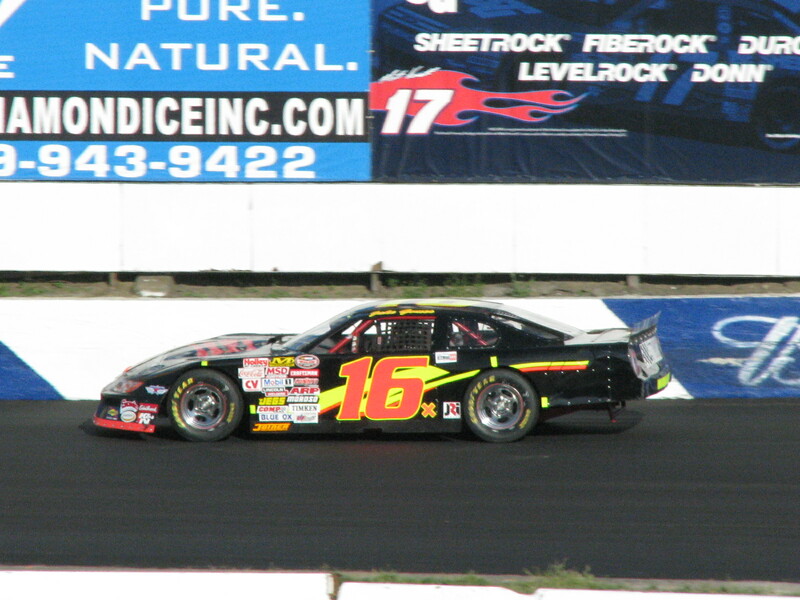 Stearns inherited the lead which he gladly accepted and took full advantage of the situation by holding point for the next thirty-five circuits until lap 105 when the #16 of Manteca’s Jacob Gomes got into the back of Stockton’s Joe Allen (75) coming out of two to draw the second yellow of the race. On lap 108 the third yellow flew as the #15 of Belletto spun up in turn three. Stearns would continue to lead, despite several more caution periods, due to some absolutely fantastic restarts on his part. However, on the lap 121 restart, Gomes appeared to push Stearns high and both cars made contact sending the #8 car careening down the frontstretch and coming to rest against the inside wall in turn one. Track officials decided Gomes was not at fault and was allowed to hold his position at the front of the pack. On the restart Gomes would grab the lead and never look back as he crossed the stripes for his second win of the season and the all-important Tri-Holiday Classic Championship. “I don’t know what happened on the frontstretch, we hit every time down the frontstretch, he must have turned left harder on that last restart, I don’t know what happened,” said the sixteen year old Gomes. Of course, Stearns had a different point of view, "I gave him three clean restarts, and I guess he didn't like getting beat," said the extremely disappointed Stockton driver, "You'd think if you take out the leader, you would be sent to the back." Greg Potts (12) of Stockton came from deep in the field to finish a close second while Ranuio rebounded to finish third with Manteca’s Ross Strmiska (90), after several visits to the pits, managed to bring it home fourth and Stearns made a late-race charge to come back to fifth. The race was plagued by a total of seven yellows and a red, but, nonetheless, was very exciting for the fans in the stands. The Grand American Modifieds came home again to entertain a crowd of nearly 4000. The Points Race in this Division is much closer with the top four mathematically still alive, but the focus remains tight on the top two, Young Gun Michael Ostrowski and “The Scientist” Scott Winters who trails by a mere twelve points coming into tonight. South Africa’s David Crouch (2) led the field to green with the #17 of Jim Marchino at his side. At the flag stand, after an absolutely great move, the #4a of Paul T Henry grabbed the early lead as this one got underway, but was halted on lap 4 when Stockton’s AJ Rider (62) slowed on the track and ducked into the pits bringing out the first yellow of the race. Henry pulled out to a comfortable lead on the restart, but Scott Winters (24) of Tracy, after starting shotgun on the field and working his way to second, began to reel in the #4a until lap 22 when Winters made his patented move coming out of four to capture that all-too-familiar top spot and pull away to a three-quarter straightaway victory over second place and Points Leader Michael Ostrowski (17x) of Salida in what would be Winters twelfth win of the year and the Modified Tri-Holiday Championship. “This feels just awesome. You know, Stockton’s a great facility, these Tri-Holiday races are super and I can’t thank my team enough,” said an always gracious Winters, “This just feels great.” Rio Linda’s Mike Regelman (5a), with another great showing, finished on the podium in third while Henry slipped back a bit to fourth with the amazing young, and South Africa’s own, David Crouch holding on for another outstanding top five finish. After a very exciting weekend last week, the ALSC/Street Stocks were back to business as usual, and if you’ve been lucky enough to catch one of their races this year, then you know business as usual comes in the form of metal-scraping, fender-bending pleasure. The Points Race in this Division has come down to two drivers: Points Leader Jeff Ahl and Aaron Coonfield. Lodi’s Steve Fraser Sr. (12) and “The Iceman” Chad Holman of Manteca (75) got this one underway from the front row with Holman jumping out to the early lead only to be slowed on lap 2 as “The Sergeant” Zack Huffman of French Camp (50) spun in turn two attracting the one and only yellow of the night. On the restart Holman held point, but he had company in the form of Aaron Coonfield (25) of Riverbank who pulled off the pass for the lead on lap 4 and brought with him the #79 of Escalon’s “Slammin” Sammy Solari. On lap 19 Brock Monroe (42) of Escalon lost a motor which brought out the red flag for the extensive clean-up. When racing resumed, Solari would beat Coonfield back to the stripe for the lead where he held command until lap 50 when Lodi’s Steve Fraser Jr. (54) began to experience engine woes of his own which resulted in Solari and Brian Vosburg (89b) of Stockton getting into the oil laid down on the track and tangling with the fence between turns three and four bringing out the second red of the night. On the restart Points Leader Jeff Ahl (31) of Lodi jumped out to the point and from there it was smooth sailing as he crossed below the checkers for his third win of the year and the ALSC/Street Stock Version of the Tri-Holiday Championship. “It got a little bit rough, but we just stuck it in there and got it done,” said the jubilant Ahl, “When I washed up between one and two I was just trying to keep it together up there after getting in a little too hot, I just overdrove the car, but it worked out.” Solari held on to finish second while Coonfield was third with Holman fourth and Mark Squadrito (31x) of Livermore making up the top five. Points Leader Ben Lewis II is in control of the Bombers with a healthy lead over “Redneck” Russell Johnson Jr. They rumbled back onto the racing surface this evening to pick up where they left off two weeks ago. Of course, even though Tom Dahl isn’t in the Points Battle, he does have to be considered every week. The #22 of Lewis started on pole with Johnson’s #23 at his side. Lewis grabbed the early lead, but on lap 3 the first yellow of the night fell as Peggy Sue Jared (313) and Lisa Johnston (808), both of Stockton, tangled coming out of four. On the restart Lewis maintained the lead, but this time with new problems gnawing at his back bumper in the form of Stockton’s Tom Dahl (4), who had made his way quickly through the field from the number nine position on the grid, and, on lap 18, he made a great move to get underneath Lewis for the lead. Dahl held strong for the next twenty go-rounds, but on lap 38 he drove it too hot into one allowing Lewis to get back by if only for a brief moment. On lap 42 the second yellow went flying as Lewis got together with the lapped car of Mike Massone (505), which handed the lead back to Dahl. On the restart the #4 remained out front until lap 53 when the third and final caution of the night was displayed when the #420 of Jessica Rathjen lost it coming off two and spun head-on into the backstretch wall. As the green flag waved to restart the race, Dahl once again darted to the point and pulled away to the checkers for his sixth win on the season. “That was chaos out there, that was epic, that’s for sure,” said the soft-spoken Dahl, “I would like to thank all my sponsors, my dad and my beautiful wife.” Although Lewis finished second, he came away with the Bombers Tri-Holiday Championship. Stockton’s Brandon Jones (33) did a fantastic job with a podium finish in third. Jared and Johnston both recovered from their earlier mishap to round out the top five. Next Saturday, September 12th, join us on Budweiser Night as the NASCAR Whelen All-American Western Late Models run Twin-50’s, Grand American Modified, ALSC/Street Stocks and the Bombers. DOUBLE POINTS for all Divisions, except the WLM.